Russian certificates of quality, GOST R certificate of compliance. 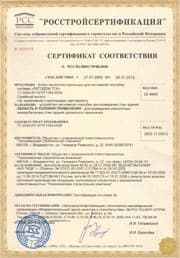 (certificate of quality, GOST R certificate) Russian certificate of compliance certifies the quality of actually shipped goods, as well as their correspondence to the terms and conditions of the contract. 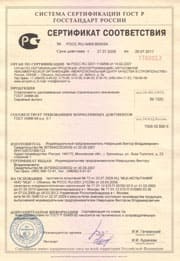 Russian certificate of compliance gives characteristics of the goods or confirms correspondence of the goods to definite standards or specifications of the order. Russian certificate of compliance is issued by competent organizations accredited by rostechnadzor, chambers of commerce, special laboratories in the country of export and in the country of import. The parties of the purchase-and-sale contract can agree about submitting the russian certificates of different governing and supervisory institutions. Product GOST R certificate of compliance is intended for certifying a consignment of goods delivered to Russia by the importing company, or imported batch products. In the first case the certificate is registered for the company supplying the products to the Russian market. The term of the russian certificate validity depends on the provisions of the sales contract. In the second case it is a foreign manufacturing company, which declares and receives a GOST R certificate of compliance for delivered goods. A russian certificate of this type is effective during the term indicated in the GOST R certification document. Legalization of the certified product is carried out by the Russian experts at the manufacturer's facilities. A correspondence GOST R certificate of compliance for batch production is issued based on the laboratory tests of the product samples. Product russian certificates of quality can be issued only on availability of the additionally required GOST R certification documents: a hygiene certificate, a veterinary certificate, a fire safety certificate, etc. An GOST R certificate of compliance is issued with reference to the above-indicated documents. GOST R certificate of compliance can be voluntary and compulsory. The goods, which are not subject to compulsory russian certification, can be imported to the Russian customs house on availability of the refusal letters. 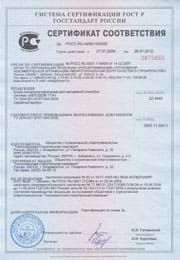 Russian certificates of compliance are registered in Russia based on schemes 7 (GOST R certification of goods consignment) and 3А (russian certification of production conditions).